Wingstop fans, something exciting is coming your way! Indulge in Wingstop's newly launched hand-breaded wings – bigger, juicier & just as flavorful! For 9 days straight from 9th Sep to 17th Sep, fans who purchase a 6 pc Hand-Breaded Wings Combo will get another FREE! 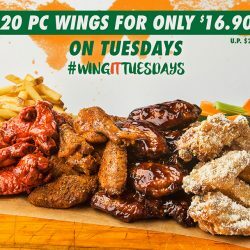 7 Mar - 9 May 2017 Wingstop: 20 Pcs of Wings for only $16.90 on Tuesdays! 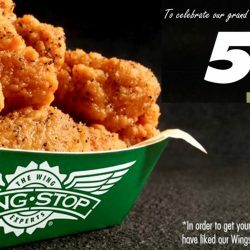 Introducing Wingstop's #WingItTuesdays deal which will definitely make your Tuesdays so much more flavorful! 20 pc wings sauced up to 4 flavors for just $16.90! This promotion will be going from 7th March to 9th May only! Hurry, spread this exciting news with your friends now! 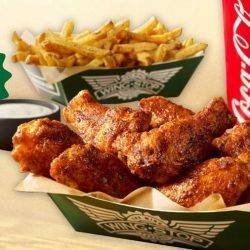 8 Oct 2016, 11am - 3pm Wingstop: 5 FREE Wings & a Coca-Cola Freestyle Drink Per Person at VivoCity, No Purchase Required! To celebrate the grand opening of Wingstop at VivoCity #02-143, they will be giving away 5 FREE WINGS & a Coca-cola freestyle drink per person on this Sat, 8th Oct 11am - 3pm! No purchase necessary! All you need to do is to LIKE their Facebook page & present it to the staff in-store! While stocks last! Like & share it with your friends now! See you there on Sat!